Foreword by H. Tristram Engelhardt, Jr. This work will shape the philosophy of medicine for years to come. There are very few scholarly endeavors that truly encompass a field while also having the promise of shaping and changing that field. 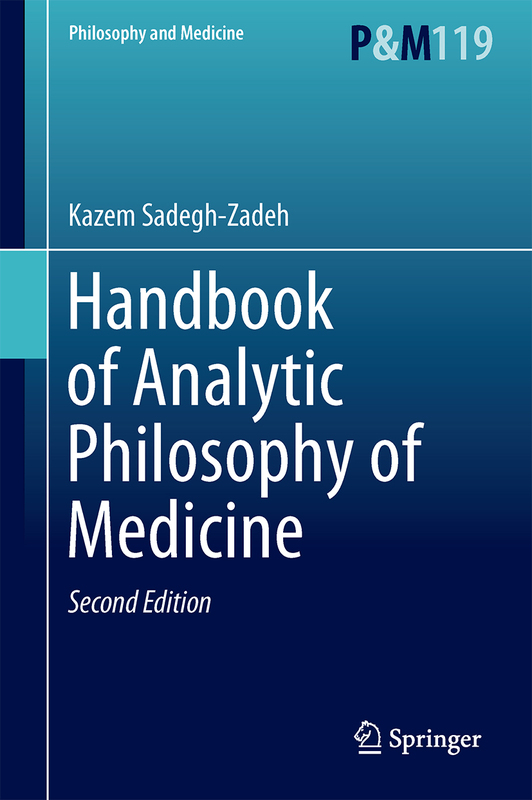 Kazem Sadegh-Zadeh has produced such a volume for the philosophy of medicine. This is a foundational work of amazing depth and scope, which is also user-friendly. No one engaged in the philosophy of medicine will in the future be able to proceed, save in the light of and in response to the analyses, arguments, and reflections Sadegh-Zadeh has compassed in this extraordinarily rich and important study. He has succeeded in bringing together in an integrated vision an exploration of the epistemological, practical, and logical frameworks that sustain the engagement of physicians, as well as define the place of patients in medicine. This opus magnum provides remarkably careful explorations of the concept of disease, as well as of the diagnosis and treatment of patients in the acts of medical knowing and treatment. It situates the intertwining of diagnoses, the appreciation of therapy warrants, and the engagement of physicians in treating patients within the complex phenomenon of medicine. This work even has what is tantamount to an appendix that shows the bearing of logic on medicine. The work begins with a careful exploration of the language of medicine, attending to its epistemic impact, its syntax, semantics, and pragmatics, including the various ways in which medical concepts are framed and engaged. Sadegh-Zadeh then examines medicine's encounter with the patient as a biopsycho-social reality caught up in the drama of health, illness, and disease. In this study of medical practice, Sadegh-Zadeh creatively attends to the interaction of patient and physician in clinical practice. His analysis of the interconnection of anamnesis, diagnosis, prognosis, therapy, and prevention in the clinical context is innovative, displaying a remarkable depth of understanding that constitutes not just a foundational contribution to the literature, but a reframing of the field. It offers a comprehensive perspective, which is a tour de force. Drawing on a nuanced and subtle appreciation of epistemology in general and an account of the character of medicine in particular, Sadegh-Zadeh explores the semantics and pragmatics of medical knowledge. He then relates these reflections to the intertwining of moral concerns, the character of logic in medicine, and a consideration of medical ontology within which, among other things, he provides a careful analysis of medical reality and the character of medical truth. He ties all of this to what can only be described as a powerful vision of the conceptual fundamentals that constitute the scope of the philosophy of medicine. Sadegh-Zadeh offers what will without doubt for the foreseeable future be the most widely influential and comprehensive account of the philosophy of medicine. This impressively nuanced work bears the mark of a lifetime of research, reflections, and publications on the philosophy of medicine. While others were engaged in the birth of bioethics, Sadegh-Zadeh was focusing with critical energy on the philosophy of medicine. As a result, he became one of the central figures driving the re-emergence of the philosophy of medicine as a scholarly field. Early on, he helped to establish and then expand the scope and depth of philosophical medicine. One must note in particular that he aided in supporting scholarship in the philosophy of medicine through his pioneering work with his journal Metamed which was established in 1977, and which then later took the name Metamedicine and which finally became Theoretical Medicine. He has also been involved from the early years in The Journal of Medicine and Philosophy. Both through his own scholarly articles, as well as through creating vehicles for the publication of scholarly articles, his work in the philosophy of medicine has helped locate bioethics within the broader geography of the foundational explanation and therapeutic concerns that define medicine. As a physician and philosopher, Sadegh-Zadeh has without flinching addressed the conceptually challenging issues that lie at the basis of a philosophical appreciation of contemporary medicine. The result is that Kazem Sadegh-Zadeh has come to have a command of the philosophy of medicine possessed by no other scholar. Drawing on a rich lifetime of scholarship, Sadegh-Zadeh has been able to integrate recent work in epistemology, the philosophy of science, and logic in a work in the philosophy of medicine. Because of his disciplined and innovative eye, this volume sheds a bright analytic light on the character of contemporary medicine and charts the future of the philosophy of medicine. It is marked both by creativity and an encyclopedic scope, and will establish itself as the standard for the field. It is likely that no one could have accomplished such a substantial exploration of the nature of medicine, other than Kazem Sadegh-Zadeh. He has produced an indispensable resource for scholars in the philosophy of medicine, including those working in bioethics. This work surely secures Kazem Sadegh-Zadeh's place as a cardinal founder of the contemporary field of the philosophy of medicine.